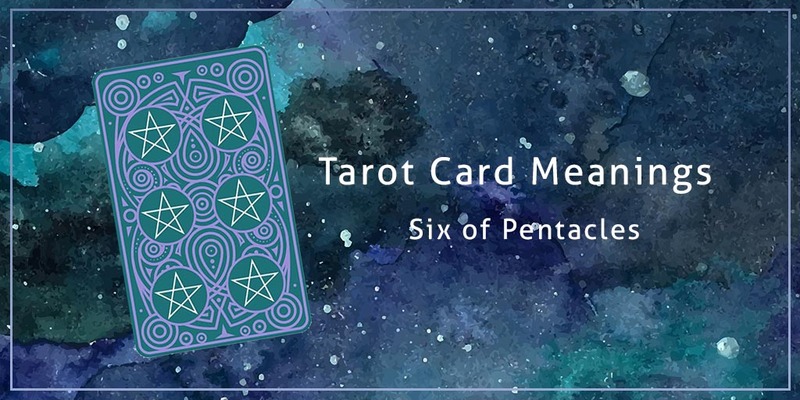 The six of pentacles can be an interesting card to reveal during a tarot card reading, so if this card has come up in a recent tarot reading, you might want to learn a little more about it and what it can reveal about your life! This card is generally a sign of life improving and changing for the better, especially when it comes to money. The six of pentacles often represents generosity, charity, and kindness, either in the form of giving to somebody else who needs it, or you may soon be the recipient of somebody else’s good nature. This generosity is not always necessarily monetary but wisdom, advice and a helping hand is also likely with the six of pentacles. The six of pentacles is a great sign when it comes to money and finances. You can be sure that you will soon be rewarded generously for all that you have worked for. It is also a time to consider being charitable with your finances, as you are now likely to be in a position where you are able to offer financial assistance to those who are not as fortunate as you. This is a very positive card, you are likely to be heading towards success, so continue to work hard and remember to accept any offers of help that come your way. This is a time to take any words of wisdom or assistance that are offered to you by a very caring person! For those already in a relationship, the six of pentacles indicates a happy and stable partnership. Your partner may be feeling generous, so allow them to give to you, whether that be in the form of material gifts or something even more meaningful. You deserve to be spoilt! If you are single and looking for love, the six of pentacles can point to someone kind and generous appearing in your life. This person will be extremely positive, so be sure people know that you are looking for a partner, as this new love is likely to be introduced to you through somebody you know. When the six of pentacles appears in a reading, it can point to a positive change in your health. If you are currently suffering with an illness, then healing is on its way, but remember to remain positive. Do not hesitate to ask for or accept help when it comes to your health. Are you not seeing or accepting the generosity from others around you? The six of pentacles reversed indicates that you have been unaware of, or are too proud to accept sources of help that are available to you. Don’t make this mistake! Alternatively, you may have been a little too charitable of late, be careful who you lend your money to and don’t let your generosity get you into financial troubles. Avoid financial risk and over spending when the six of pentacles reversed is revealed. When it comes to your own generosity and being charitable with others, be careful who you lend your hard earned money to, as not everybody can be relied upon to pay you back. Do not give away more than you can afford to. If your goals are work and career related, the six of pentacles reversed serves as a reminder for you to be generous with the time and attention you dedicate. Being friendly and helpful around the office will make you and everybody around you much happier, and this will be remembered! Is one partner in your relationship doing a lot of the taking, but not a lot of the giving? Remember that a relationship should be equal, so if this sounds like you then try giving more, instead of expecting more to be given to you. If your partner is doing all of the taking, be careful your generosity isn’t taken advantage of. If you are single and looking, you should open yourself up more to the possibility of love. It’s great to be independent, but try not to risk alienating potential suitors with this fierce independent attitude. In answers to health related questions, the six of pentacles reversed indicates a need to be more open to new ideas in order to improve your health. Have you dismissed a new exercise routine or healthy regime a little too quickly? It might be time to think again. Want to learn more about the tarot and what the King of Pentacles can mean for you? Our gifted tarot readers can help!